It’s always cool to see a worthy country and western artist gain the attention of a huge celebrity, especially when they’re otherwise burdened by obscurity due to the massive apparatus of mainstream music not giving them even as much as a sniff of attention. Such is the case with Saskatchewan native and incredible country and western artist Colter Wall. Adding the the “western” to “country” isn’t deprecated language when it comes to Colter and his haunting voice that awakens the moan of the wind across the open Canadian plains, and the howl of the lone wolf burdened by lonesomeness and hunger. This week well-known American actor Jason Momoa was singing the praises of Colter after seeing him perform at the Commodore Ballroom in Vancouver, Canada on Saturday night (1-19), and later hanging out with him backstage. The native Hawaiian is best known for portraying Aquaman in the DC Comics universe, including in his own dedicated movie on the Aquaman character released in 2018. Jason Momoa has also starred in Game of Thrones, Stargate Atlantis, and the Netflix series Frontier. Jason Momoa also shouted out Ft. Worth songwriter Vincent Neil Emerson who opened the Vancouver show, and Kentucky songwriter Ian Noe who is also touring with Colter, known collectively as the Scary Prairie Boys. “Look out for Vincent Neil Emerson and Ian Noe, a couple badasses on the come up,” Jason Momoa said. Colter Wall’s latest record Songs of the Plains was released in October of 2018, and was named a Saving Country Music Most Essential Album. Ya know, all it would really take to set off a good country and western resurgence would be one fantastic soundtrack to one of these popular superhero movies. Could be cool. Marvel, though, since DC movies are horrible and have been since The Dark Knight. You obviously haven’t watched Aquaman. It was great. I haven’t, and i don’t plan to! Haha. If i keep hearing that it was great, then i’ll eventually catch it once it hits on demand or netflix or something. I WANT DC movies to be good, but they never are… evne WW was only alright to me. Anyway, glad to hear you liked it. Dwayne Johnson loves Cody Jinks, and Jason Momoa loves Colter Wall? Well, some of modern country’s best seem to have the Polynesian bodybuilder-turned-action star contingent on lock. I haven’t seen this sort of weird ethnic minority love for lily-white musicians since Mexicans fell in love with Morrissey and South Americans fell in love with Iron Maiden. Ohhhkay… or, it could be that men like masculine music. I realize that might make some heads explode these days, but historical trends seem to bear it out. Who’s talking about “masculinity”? Clearly, I was just being racist. Also, clearly, not being serious. Pretty cool. But, what constitutes a “massive” fan? Has he done other things besides going to a show and instagramming about it? Eh, just being hyperbolic. However apparently they made multiple videos backstage that are going to be published at some point. I do think the guy is a really big fan. He is literally a very large person. Trig, you follow this guy? 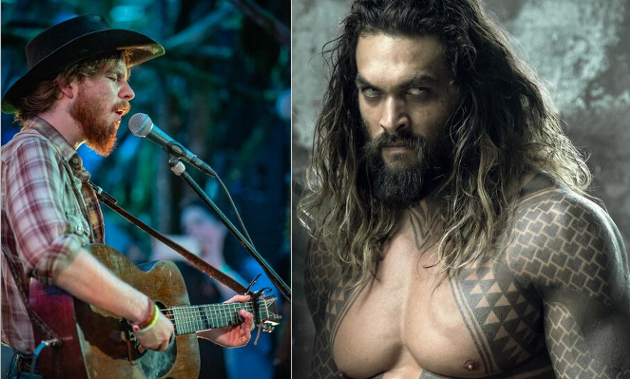 I discovered Jason Momoa via Colter Wall. I saw Colter a couple months ago. Me and the wife got tix few days before show. Show was in a 900 seat theater and it was pretty much sold out. We ended up in balcony looking down. I have to say this guy is mesmerizing live. There were moments in the show when people were so focused him, no one was making a sound at all and spellbound by him. I also am not saying it wasn’t a enthusiastic vocal crowd, it very much was. His sound begs for perfect attention sometimes. I could actually make out the sound of the front door of the theater creaking out in the lobby. Video of Ian Noe just posted on YouTube. It’s killer. He’s killer. Thing was posted 2 hours ago, and it already has 12,000 views. Damn, that was good. And what a genuinely cool person Jason seems to be.